← Peter Wadhams Grants The Arctic Another Reprieve! Climate experts at the EPA say declining snow cover is an indicator of global warming. Scientists have been assessing global warming by looking at declining snow cover for decades. In 2007, the Rutgers University Snow maps were cited as proof that your SUV was destroying the planet. The same Rutgers University graph updated through 2018, shows that snow cover has been increasing for 30 years, and has been above normal for most of last fifteen years. So using the logic of climate scientists, that must prove global cooling. But not to worry! Climate experts had all their bases covered, and started blaming snow on global warming over 20 years ago. Ninety-seven percent of experts now agree, record high snow extent is sure-fire proof the planet is overheating. CO2 is a magical and evil molecule, and all natural phenomena (observed or imagined) can be blamed on it. I have had 2 neighbors claim the Oct. 15 low of 10F due to climate change caused by Americans. Followed by ‘we’ should do something about the climate. I say, “What should we do?” They respond with gibberish about recycling and Americans have too much trash. Also “Man is ruining the planet for the trees.” These are people who all have at least a Masters Degree. Be glad you have such tolerant, open-minded and peaceful neighbors. The progressive citizens of the People’s Republic of Boulder don’t stop at gibberish. They like to talk about arresting climate deniers and putting them on trial. I haven’t denied climate even once in my life but that would not matter to them. I am not so sure my neighbors are that open-minded. They seem awfully shocked when I say that I don’t believe any of the propaganda about climate change being man caused or having anything to do with Fracking, Donald Trump, CO2 or the stuff Americans throw away. What your neighbors really want is for other people – YOU, or better yet, the government – to take action. When they answer your question, they aren’t talking about themselves. Let me share a little vignette – a friend of mine, nice lady really, has a rental and is having trouble with the renters. Pretty typical stuff, until she got to the part about the renters not sorting their trash correctly, putting recyclables in the garbage-can sort of thing. She became visibly upset at that, no matter how many times she had told them how important it is to separate their trash. She almost started to cry. It was then that I got a tremendous insight into the whole global-warming thing. My theory is that some people, probably a sizable minority of people in America, have a sort of cleanliness-obsessive fetish; and Mann-Made Global Warming propaganda is designed, cleverly designed, to appeal to their neurosis. There is no arguing with such people. Just nod your head. Give them a hug. They are suffering. 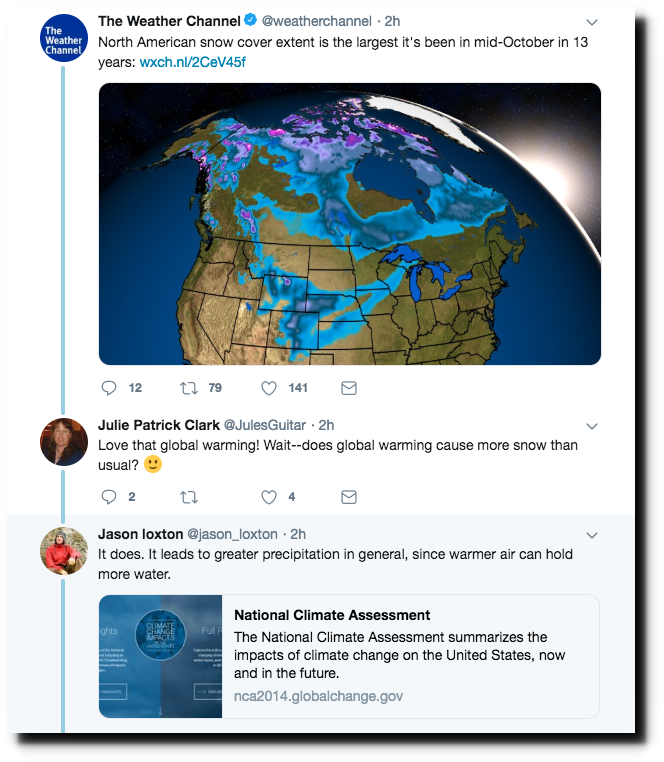 I have an AGW-believing sister who is highly confident the arctic will be ice free in just the next year or two, and wanted to put my skepticism to the test. But what she proposed sounded more like a bet than a scientific test. What test would AGW alarmists agree to that would disprove global warming? Answer: None. This “Snow is Proof Of Warming”/”No Snow is Proof Of Warming is a heads-I-win/tails-you-lose way of defining the rules of the game. I have a brother just as stubborn. He refuses to even consider I might be right and refuses to even look at the facts. Actually my whole family is convinced the sea levels are rising, except for my 90 year old mother. She knows it is all nonsense. If you want to have some fun with them, I suggest you ask them to pick a spot in the world, and study it together. It does not matter where it is. Collect data, long-term data. Graph the trends, study the tectonics and isostatic elevation changes, study historical records, beachfront pix, everything you can find. For even deeper fun, pick 2 locations, study and then compare them. Unless you are lucky, the results will be different. Then, you get to noodle over why they would be different. Write a summary report together: ‘Straight Shooting on Sea Level’ by the Oakley Family. Add tides and storms to the list, too. And, go to the locations. Most of the family lives in Virginia Beach, Navy of course, and as we sat on the Beach last summer I mentioned it looks exactly same as it always looks. (I was thinking about how Tony always posts those pictures of Daytona Beach and points out that sea rise is imperceptible.) They told me the beach looks the same (we lived there as kids too) because every year the city dredges up the sand to put back on the beach. Pretty foolish to believe this is the same as sea rise. I did up a couple graphs several days ago, of the Rutgers Snow Lab data and UAH northern hemisphere LT land anomaly data. UAH is upsidedown to make it easier to line up the snow cover spikes with the temperature spikes. 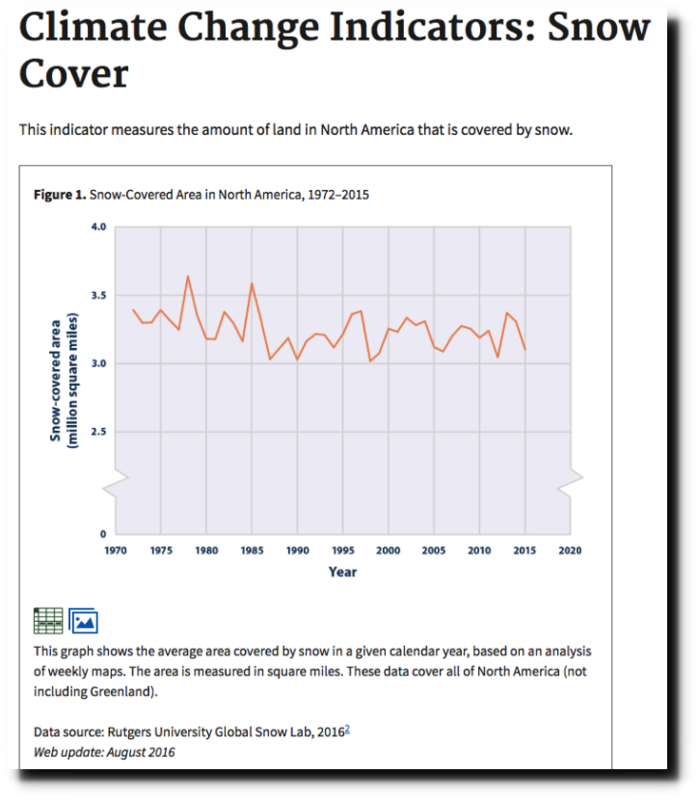 There’s an exact match as you might expect: cold causes more snow cover. 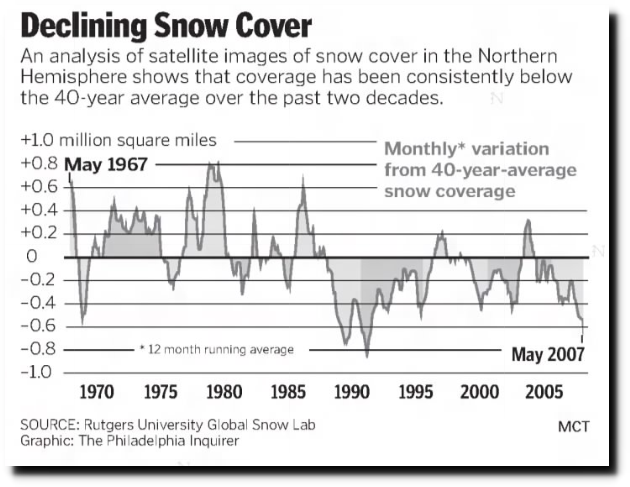 But what is interesting is snow cover trend is flat from mid 1994 but UAH is rising. 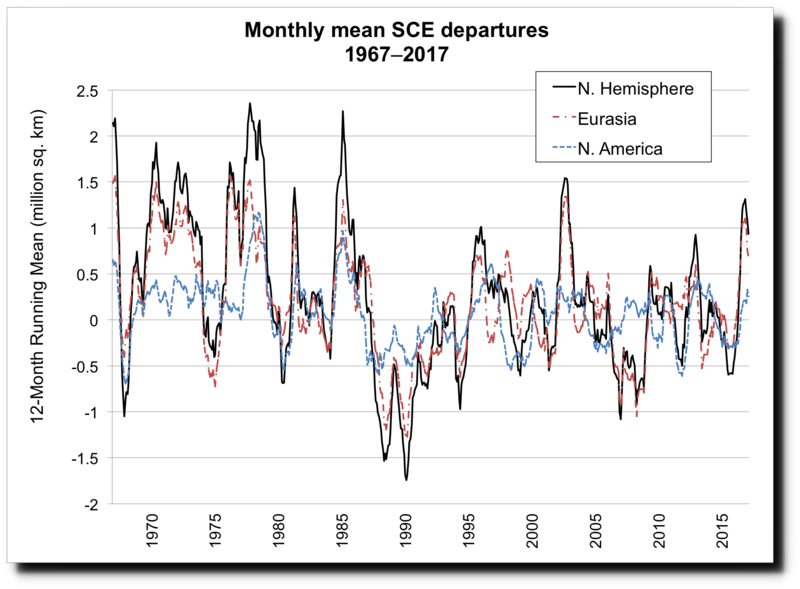 This suggests that even UAH has a warming bias in the data which isn’t there in the real world. Snow of course ignores temperature adjustments and is easy to measure from orbit, unlike temperature.